Jessicas Ghost are an alternative folk infused rock band from Liverpool and Manchester, whose extensive range of musicianship benchmarks them as a progressive, eclectic band. With Emma Thorbinson on vocals/acoustic guitar, Christoph Demetriou on vocal/violin, Ian Moxham on bass/vocals , Christopher Shaw on lead guitar, Dave Thorbinson on drums and Craig Smith on keyboards, Jessicas Ghost are very much the established band. 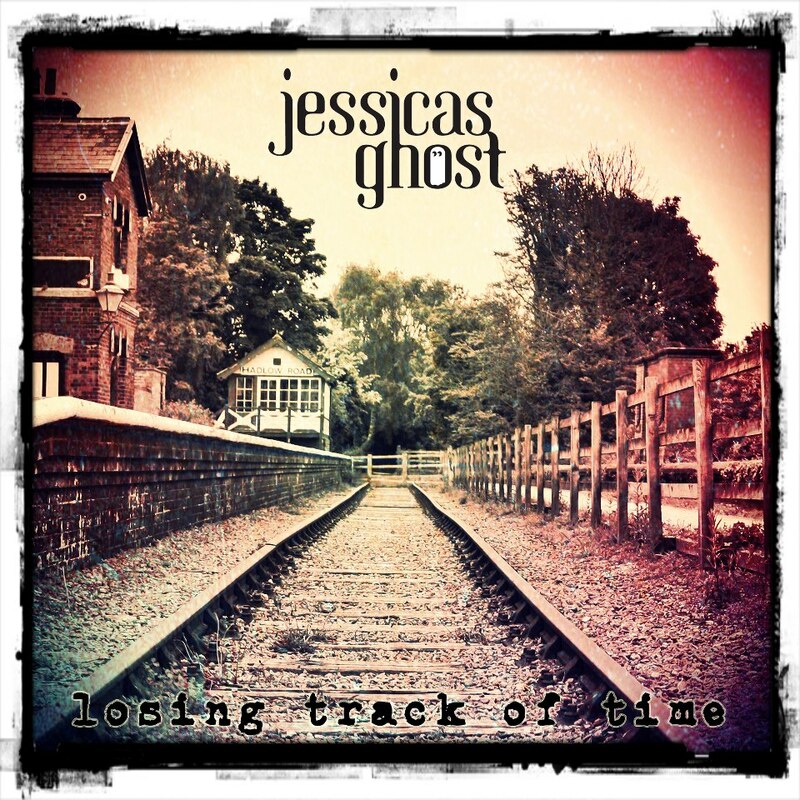 Having released their debut album “The Winning Hand” in 2009, Jessicas Ghost are now back with their second album “Losing Track of Time”, which is due to be released on October 27th 2012. As the title suggests, “Losing Track of Time” is a contemplative album which is poetically pragmatic, whilst wrapped up in a warm nostalgic blanket. It’s a mixture of classically composed tones, antagonised and air-lifted by the frenzy of riffs. It’s an enjoyable album, which wistfully reflects, whilst bustling with an impetuous energy. All Because of You is a happy go-lucky song, which shines with a youthful glimmer, whilst simmering with an understated baroque exuberance. Musically textured, All Because of You’s skill lies in the way the eclectic sounds independently spin and splutter around the pure vocals, that reunite in unison. With the staccato violins, bouncy bass and rolling piano, All Because of You rolls on choppy and mutable waves. It’s an infectious song whose erratic and quivering guitar hijacks the wholesome backdrop, jump leading the song towards a more rocky edge. What’s interesting about the All Because of You is how the distinctive riffs become subdued against the bluesy, staggered interlude. It’s a dynamic twist that strips back the gloss, revealing with triumph, the idealism of the song. 10 Years is one of those songs which wallows in nostalgia whilst mulling in melancholy. It’s an infectious song whose lyrics narrate with kitchen-sink realism, which is neither bleak nor despairing. Lyrics such as, “She packs her bag on a Tuesday night…” are delivered with a calm clarity amongst the upsurge of jangly guitars and leisurely bass. It’s also a song which sees vocalist Emma resonate and contrast against the violin squiggles and shuffle synths. What’s great about 10 Years is that despite the undertow of sorrow, it’s the intricate detail such as the gentle acoustics and exquisite piano that cements the song as a poetic track. 1989 again illustrates Jessicas Ghosts skill at producing sentimental songs which unravel with ease against a harmonious musical backdrop. With its smooth electric guitar intro and undercurrent chilled out piano, 1989 stretches the imagination without being too taxing on the emotions. It’s a sweep of nostalgia, condensed in a country-folk/soft rock package. With Emma’s serene vocals, 1989 oozes a laid-back charm which is elevated by the curling and plucky riffs. It’s also a song whose chiming keyboard interlude is eclipsed by the Oasis-esque riffs that preen and swirl against the nostalgic lyrics. From it’s catchy and piercing intro, AO soon branches out into a relay of overlapping sounds. It’s a busy number, which showcases the intricate arrangements of Jessicas Ghost and whose equilibrium is uprooted by the jangly and reverberating riffs. With its striking violins and hasty keys, A-O pulsates with a boisterous beat. Along with its contrasting vocal arrangements, A-O is a song which conveys an understated chaos, whose concealed sentiments are revealed through the heartfelt lyrics.